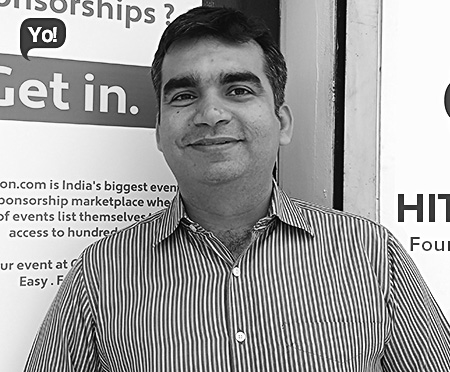 Mumbai based startup onspon connects brands with event organisers through an algorithm based on the demographic data of audience, geography targets of brands and marketing budgets of brands. The company has raised Rs. 1 crore from Swan Angel Network. This money will be utilised for scaling up operations, marketing and enhancing the technology backbone of the product (Onspon.com and sub products). ''There is no revenue source for events in India apart from ticketing but the costs associated with creating high quality events are high and are growing by day; hence the net result being diminishing returns in the event business leading to shortage of quality events and the dispersed nature of the industry,'' said Hitesh Gossain, Founder of Onspon, an IIM Ahmedabad alumnus. Question- How did you get idea for the business? Answer-It all started when I was managing sponsorships for the events at IIM Ahmedabad and realized that despite me being from one of the most premier institutes of India - it was a challenge. When I took a job and was on other side - realized sourcing of sponsorships is a equally big challenge. Hence a perfect opportunity to create a responsive marketplace based on information arbitrage and knowledge enhancement. My last salaried role was as the CEO of Percept – and that’s where I realized that this is a challenge even at the level of high value events and brands. So here I was - coming across both sides of table - who were just separated by a thin line of information asymmetry - and that’s when I thought of Onspon. Question- What was your mission at the outset? Answer-Sponsorship seeking is the single biggest problem area for any event organiser. We identified this by means of research which we did before starting the business. The idea is to help them understand how to do it - and do it in a scalable manner - hence the idea was to have maximum events listed and the maximum brands to view them - We created two teams - one to seek events and the other to seek brands. Question- How many employees work in the enterprise? Answer-There are only 13 employees in the venture. Question- How do you advertise your business? Answer-We do not charge the brands or their representatives to view and evaluate events. The idea is for them to develop a comfort around the service being offered and the economics being based on scale rather than transaction fees. No one has ever attempted to do it this way – hence a lot of engagement through mailers and posts are getting generated. We are also invited to a lot of brands forums where we engage with brand stakeholders to help them understand our model. Events find us using Google ad words and other digital marketing we deploy. The event seeking process is now 90 percent automated where most of the new event queries are generated either digitally or through word of mouth. Brand seeking is relatively more challenging but as the revenue per brand is significantly high - on-boarding them is the clear focus now. Question- To what do you attribute your success? Answer-As we are trying to disrupt a very archaic media sales setup, there was a lot of resistance by the agencies who are brand custodians on media procurement decisions. Event sponsorships happen to be non-traditional media. Here my experience of working with one of the biggest EMC organisations came handy and we created a structure where agencies benefit tremendously from our algorithms and use it to recommend their clients the best partnership opportunities - which as almost impossible earlier. Question- What made you choose your current location? Question- What is the unique about your business? Answer-There are multiple small time consulting companies who do it on project basis however there isn't anyone who is doing at on a marketplace model. There are a few global peers like sponsormyevent.com , sponsorist.com, sponsorhub.com etc. On a product enhancement level, there is IEG which is the biggest consulting company for sponsorships globally. India is a very different market where the average value per event is lower and the sheer numbers are massive. The brands also are keen on engagement matrices which can be established only at a certain scale hence we think we are poised to create a significant traction in this space. Question- What are the responsibilities as the boss of a firm? Answer-Overall growth focus and development of all associated pillars to achieve that - which includes correct hiring, product market assessment, creation of the processes of customer acquisition and engagement. Question- Does your company help the community where it is located? Answer-We hire locally and engage with the local events helping them find right sponsors. Question- If you had one piece of advice to someone just starting out, what would it be? Answer-This applies to startups in media and experiential marketing space: Think scale before monetization. There is a temptation to work like an agency and create immediate monetization but hang on to the model - the size and sheer scale shall more than make up for it. Doing everything you won’t work. Question- What are the two challenges you have faced in your business? Answer-Brand outreach and high volume engagements. Top 400 brands are already on the system but the challenge to scale up exponentially – thankfully the brands using our services are very happy and are recommending us whole-heartedly. The agencies have also been extremely supportive. Question- What do you feel about the sustainability of start ups in India? Answer-They are the ones who will define the economy of the country in the coming years. The traditional business models are getting questioned- the biggest cab operator doesn't own a single cab, the biggest hospitality company airbnb doesn't own a single hotel and so on - the innovation is widespread and the startups are leading these wings of change. Surely there are success and failures; but eventually the ones who will define success are the ones who will sail through - and startups are poised to do just that.